If you have a dress you would like to wear to prom but it does not quite have the “wow factor” that you were hoping for, do not panic. There are lots of ways to turn a simple or plain dress in to a one of a kind piece. With a little knowledge and a few sequins and accessories, you can revamp your dress into a prom gown that will leave heads turning all night long. Choose the dress you wish to improve. Try it on and look in the mirror. Decide if there is a particular aspect that you wish to change or if you just want to add a bit of extra detail. Trying the dress on before you begin to customize it will help you focus on which areas you like and which areas need a bit of work. Add embellishments to your dress. A row of sequins or jewels along the neckline, bottom of the skirt or waist can dramatically alter the appearance of your dress. 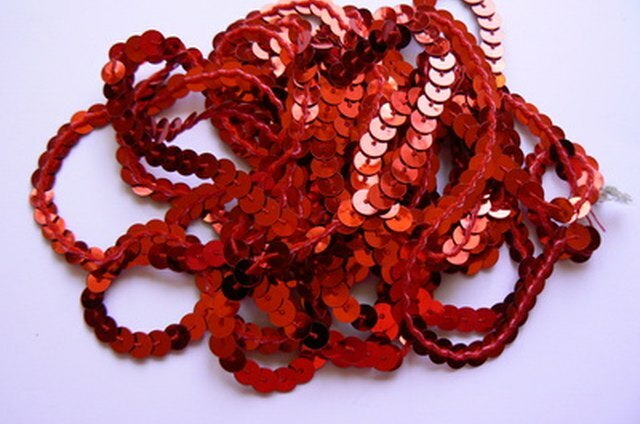 Look in craft stores for inexpensive gems that can be sewn on to your prom dress. Pay particular attention to any visible seams on your dress, add jewels to seam lines to disguise them and give the appearance of a designer dress. Iron-on or sew an applique to the skirt of your dress. A sparkly applique will draw attention to a particular area such as your legs or back. If your dress has thick straps, sew two smaller sparkly appliques on to the shoulders. Purchase tulle in a contrasting color to your dress to make an underskirt and to give your dress a fuller shape. If your sewing skills are not particularly strong, get a seamstress to make the underskirt for you. The underskirt could be hidden or an inch could be left poking out to add more color. Add a sash to the waist of your dress. A sash will define your waist and make your dress appear more formal. Tie the sash into a loose bow at the back of the dress and secure with a small stitch to keep it looking neat. Your sash should be a contrasting color to your dress, such as white or hot pink on a black dress. Accessorize your dress with bold statement jewelry such as a chunky necklace or drop earrings. Accessories can really bring a plain dress to life. Coordinate other items of clothing to compliment your prom dress, such as satin gloves or a shawl. Less is more. Change one aspect of your dress and try it on. It easier to add embellishment than it is to take it away.